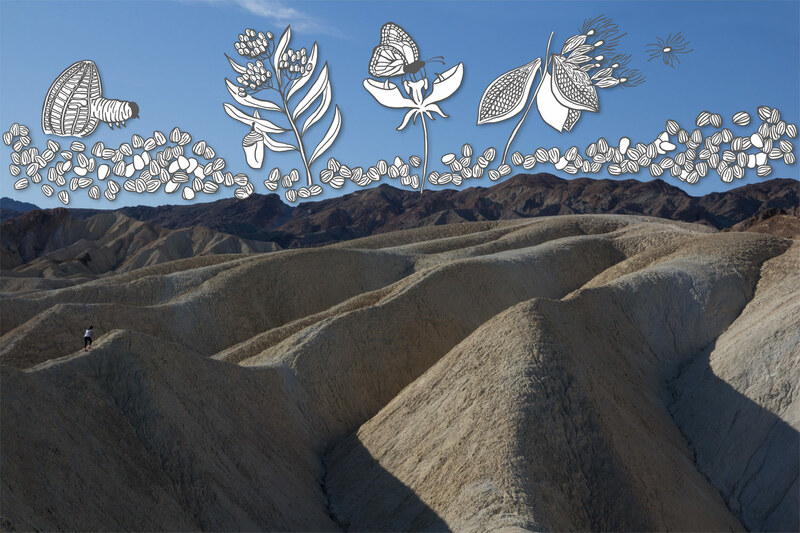 The Metamorphosis on Zabriskie Point from the Desert Walk Series imagines the cycle of the monarch butterfly with milkweed plants through the drawings over the photograph taken in the barren land of Death Valley. The population of the monarch butterfly has been declining quickly in recent years due to the use of pesticides and overdevelopment of the lands that resulted in killing their food source, milkweeds. The disappearing monarchs are just one of the many consequences caused by the climate change. Superimposed digital drawings of a monarch butterfly in different stages of life with milkweed plants and seeds over the image of the artist walking on the badlands. Photo taken in Zabriskie Point, Death Valley, California.